All proceeds benefit the National Foundation to Promote String Teaching and Playing. 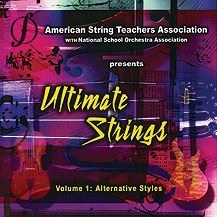 Welcome to a CD of "alternative string styles" put together to benefit the American String Teachers Association with National School Orchestra Association. The term "alternative strings" was coined as a quick and more polite way to say "everything other than classical!" This CD represents some of the dominant trends in the alternative styles movement, including jazz, rock, old-time country, and bluegrass, played by some of the leaders in each area.